ShahRukh Khan Banned 5 Years at Mumbai Stadium | GSV Films :: Film news, video songs, movies news telugu, tamil hot actress. 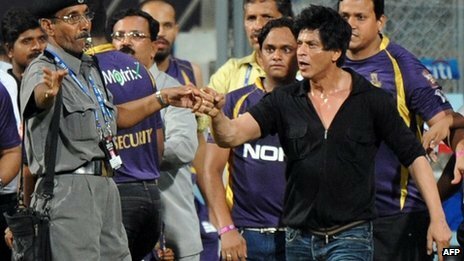 Bollywood superstar Shah Rukh Khan has been banned from entering Mumbai's Wankhede Stadium for five years after a row with Security staff at an IPL cricket match. Mumbai Cricket Association (MCA) president Vilasrao Deshmukh said the actor's behaviour had been "improper".Khan, who owns the Kolkata Knight Riders, was involved in a scuffle with staff after Wednesday night's match.Khan has defended his actions saying he became angry after the security "manhandled" children accompanying him. He says he plans to report "abusive" staff to police. Meanwhile, IPL chairman Rajiv Shukla said: "The MCA can only recommend a ban, the final decision will be taken by the Board of Control for Cricket in India [BCCI]." Good and Bad are side by side. Although he is a very good actor sometimes he has been involving in controversies since long back. Mr Deshmukh told a press conference after Friday's meeting in Mumbai that "Shah Rukh Khan's behaviour was not proper and against the rules". "If rules are violated, action will be taken. It does not depend who the individual is. It's a message to everyone whosoever he or she may be that stern action will be taken if there is any misbehaviour," he said. "The rules apply to all - no one is above them." The MCA chief added that the actor had "shown no regrets for his action and behaviour, in fact, he justified his actions". Mr Deshmukh said the decision to ban the actor was "a unanimous" one and would apply to "any match, whether domestic or international". The MCA has filed a police complaint against the actor. Khan, whose team won Wednesday night's match against the Mumbai Indians, said the stadium officials had been "very rude" to him. "They were extremely aggressive. Some of the things they said I don't even want to repeat. And yes I got angry," he told reporters on Thursday. The actor said he had not watched the match but gone to the stadium to pick up a group of 30 youngsters and his own children who had watched the match. Khan is one of Bollywood's biggest stars. He has appeared in more than 70 films, anchored television shows and done innumerable advertisements.